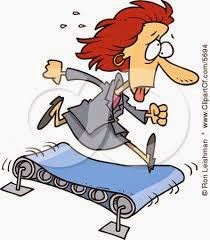 Being on a treadmill every day is great exercise – unless it’s the treadmill of the “Super Woman”. Then it’s nerve wracking and stress inducing...and something you want to get off of. who works full time, your career is just one of your jobs. You may also be wife, mother, cook, housekeeper, chauffeur, handyman, nurse, and several other occupations that Super Woman handles. You need to find a way to juggle multiple demands on your time and your emotional availability. too much noise, hit the shower, do your hair and makeup and get dressed (in your Super Woman cape, of course). Next, you wake up your husband and the kids and go to the kitchen to make coffee and breakfast, which probably consists of cold cereal, toast, or something else that is quick, easy and, hopefully, nutritious. The treadmill picks up speed. You pack lunches or get the lunch money ready and do a second check of the family to make sure everyone is awake and at some stage of readiness. schoolbook, you're informed that you need to make something for the school bake sale tomorrow, and your husband has no clean socks. Also, your husband tells you he's working late so you need to take Susie to dance class and Johnny to soccer practice. By the way, if it's not too much trouble, can you stop by the drycleaners to pick up his shirts? The treadmill is racing now. Your family looks to you to solve these problems, as if you don't have enough of your own. You have a big presentation this afternoon, there are some last minute tweaks to be made, and you still have to do a run-through so you look professional. Not only is the treadmill at top speed, it's set on "incline", and you're racing uphill, Super Woman cape flying behind you! You're taking care of everyone's needs except your own. nurturing your family. But what about you – what do you do for yourself? Think of yourself as a well that you continually draw from to nourish your career and your family. Without replenishing the well, it will eventually dry up...and even Super Woman can’t give what she doesn’t have. You, your career and your family all suffer. time and space is that you have more to give to your family and your career. You need to invest in yourself by setting aside some personal downtime and making it a priority in your life. Take a class just for fun, learn to meditate, go for a walk – there are so many things you can do. Even locking yourself in the bathroom for 10 minutes with strict instructions that you are not to be disturbed can do the trick. You are important to the important people in your life. Take care of yourself. Sort your daily tasks into "Must Do's" and "Nice To Do's". Be brutally honest with yourself...everything is not a "Must Do". Give yourself permission to carry tasks over to the following day. If you find that a task is being carried forward for a week or more, admit that it's just not that important and delete it from your "To Do" list. Carve out your own sacred time to make your life run smoother. Set boundaries around this time, and don't let anything short of a real emergency interfere.